In a conversation the other day with a retired high school librarian, I happened to mention Aramco. Much to my surprise, without any prompting from me, she launched into a long paean in praise of the company’s signature publication, AramcoWorld. Readers of AramcoExPats needn’t be reminded of the glories of AramcoWorld. If you’re like me, you’ve been reading and admiring its printed handiwork for years and years. Few companies or organizations anywhere can claim a publication that matches it in quality and content. The Smithsonian in Washington, DC, of course, and probably MOMA in New York City and a few other iconic institutions of their ilk scattered here and there, but that’s about it. AramcoWorld keeps Impressive company, making it an admirable printed goodwill ambassador for the company and the Kingdom to reading audiences around the world and a wise Public Relations investment. Every now and then, when preparing a new piece for publication in our newsletter and on our website, we stumble upon an article from AramcoWorld touching on a similar theme or topic. Often in such cases, we will quote directly from the AramcoWorld piece to amplify our arguments. Why mess with perfection? 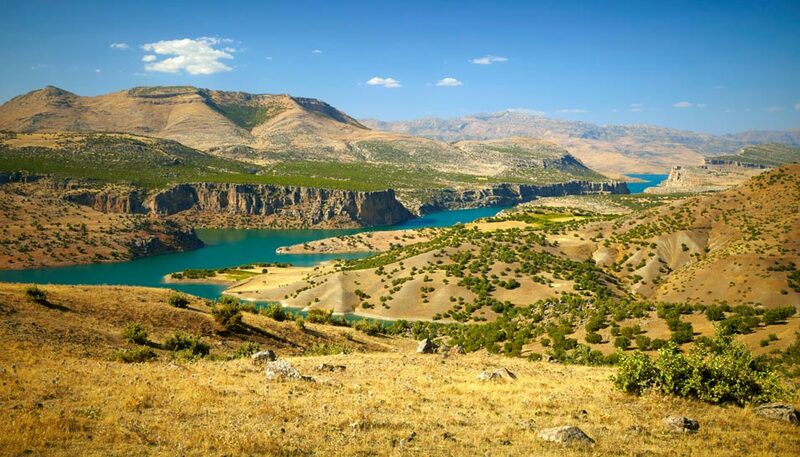 - a reasonable consideration we heeded while preparing a series of articles about an Aramcon adventure on the Euphrates River in eastern Anatolia. AXP is fortunate to have a strong and beneficial working relationship with AramcoWorld, one that allows us to offer direct links to their publication as part of the Pipeline feature found on our website. In 2018, in something of a reversal of the normal order of things, AXP published several feature articles whose subjects were visited later in the year by AramcoWorld. I’m thinking in particular about AXP articles on the dromedary camel (October), the Arabian horse (September), and Arab garb—specifically in our case the omnipresent ghutrah—(August). In forthcoming 2019 issues, AXP will be running a series of articles telling the in-depth story of a group of Aramco ExPats who 40 years ago mounted a successful assault on the dangerous, rapids-infested upper reaches of the Euphrates River in eastern Anatolia straight through the heart of Kurdish Turkey. While doing background research for the piece, we discovered a number of outstanding articles from long-ago issues of—what else? AramcoWorld—touching on the subject of past attempts to conquer the Euphrates. Realizing that a topic we speculated might be interesting to our readers was considered worthy of being featured in AramcoWorld encouraged us all the more to pursue to completion our research and writing on this subject. As for the two AramcoWorld articles in question, one, “Wreck Of The Tigris,” written by John Brinton and published in 1969, told of an unlikely assault on the lower reaches of the Euphrates in 1835 led by Francis Rawdon Chesney, an English officer in the Royal Artillery. The other, “Down the Gorge,” written by adventure travel guru Richard Bangs and published in 1981, was his first-hand account of a successful assault led by him three years earlier on the same stretch of the Upper Euphrates as that confronted by the aforementioned Aramcons in 1979. Both articles dramatically portray the dangers posed by the Euphrates to any adventurer daring enough to challenge her waters. A brief revisit here to the adventures of Chesney in 1835 and to those of Bangs in 1978, along with an account of two 1838 assaults on the Upper Euphrates led by a future Prussian field marshall, will give interested readers a foretaste of what is to come. In the spring of 1835, with King William IV himself as his patron, Chesney mounted an epic quest to transport in pieces two paddle wheel steamships made of iron—one, named the Tigris, 70 feet long, the other, named the Euphrates, 103 feet long—from the mouth of the Orontes River on the Mediterranean coast of Syria overland 140 miles through mountains and swamps and deserts to Bicerek on the banks of the Euphrates in southern Turkey. To get there, they would have to carve their own road out of the harsh wilderness. The tornado capsized and sank the Tigris, sending its captain and 20 of his crew to their watery graves. Chesney, who had been standing on the deck of the Tigris when the twister struck, was miraculously tossed unharmed onto shore. He rallied his fellow survivors, and they voted to complete the final 1,100 miles of their journey to the Arabian Gulf aboard the Euphrates despite receiving a dispatch from London calling for an end to the expedition. Thirty years passed before Chesney finally published his official report on the Euphrates expedition at the personal urging of Queen Victoria. Three years after the Tigris tragedy, two attempts to conquer the Upper Euphrates River in eastern Anatolia were led by future field marshall Helmuth Karl Bernhard Graf von Moltke—then a captain in the Prussian army on loan to Sultan Mahmud II. Von Moltke’s dramatic accounts vividly portray the dangers that Richard Bangs would encounter in 1978 and 11 Aramco ExPats would likewise encounter one year later. The Ottoman governor of the province had previously sent two rafting expeditions down the Euphrates in an effort to gauge its suitability as a transportation corridor for shipping wood, iron, and grain south into Mesopotamia where they were in short supply. Both had failed, with loss of life, but the Pasha wanted to try again. He asked von Moltke if he would be willing to undertake an effort, and the answer was yes. The only reasonable option for traveling through the territory below was by water. Preparations for a difficult overland journey by horseback were quickly made. By the time von Moltke’s party reached Sivan-Maaden on the Murad, a tributary of the Euphrates, four days later, half their horses had died on the tortuous trek. The Pasha’s great Arabian mare, however, was spared. Using a primitive-yet-effective watercraft known as a kellek fashioned from 60 inflated sheepskins, von Moltke and four companions embarked on the 10th of July, floating downriver “with extraordinary speed” to the confluence of the Murad with a second tributary branch of the Euphrates, the Firat. Together the two streams formed what we think of today as the Euphrates proper, known as the Firat to the Turks. From there they continued on to the plains of Malatya near Keban-Maaden, known for its silver and iron mines and marble quarry. Sensing danger, the party put in to shore, got out of their kellek, and climbed up on a nearby promontory, from which they surveyed the water ahead. Only then did they venture into the vortex. “These rapids always lie at those points where the precipitous bed of a small side stream flows into the river,” he went on. “Out of the ravine a lot of bigger and smaller rocks have fallen down over time. At the mouth of the brook (which in itself is quite insignificant), they pricked a tongue which diminished the breadth of the stream, and eastward there are still immense blocks of stone rolled up into the bed itself, which protrude at a low level, but higher at flood, to which they put forth an invincible resistance. The torrential river, narrowed and, thrown from its direction, bashes against the protrusions, forming above them a high wall of water, and beyond that a vast foaming and swirling stream, as if you were pouring water from a wide vessel into a narrow funnel. Von Moltke’s first trip down the Euphrates proved less than satisfactory, leaving him and Hafiz-Pasha eager to undertake another investigation into its possibilities as a transportation option in early April 1839. With the river running 15 feet higher than the previous July, Hafiz-Pasha asked von Moltke to make a second attempt to determine its feasibility as a passage for goods to Mesopotamia. The Prussian officer again accepted the commission, despite strong opposition from the men upon whom he would have to depend to carry out the task. “The most experienced of the kelektschi Kurds declared it to be quite impossible to float down the rapids,” he wrote, “pointing out that even with favorable water levels for three earlier attempts, two had crashed. At supper the Pasha proposed to me the expedition. I therefore rode that same evening to Esebeh on the Murad, where my kellek or raft was quickly built by torchlight and was afloat soon after midnight. Towards sunrise I came to Kemer Khan where the difficult spots begin. That was certainly bad. What had once been rapids was now a waterfall, and before Serpent Mill I had to disassemble my ark into its integral parts, carry rods, tubes, and luggage over land, and reassemble it all below the cataract, which took three hours. “Above Tilek, the raft had to be taken apart again. It was not possible to get through the waterfalls and the surf from there. At sunset we landed at Tilek, where we stayed the night. In six days, we had covered a distance for which I used four and twenty over land. Accompanying me was an engineer-colonel, Mehmet-Effendi, and his companion. They told me that they did not feel obligated to accompany me any further, that they had had enough, to which I had no objection. “As soon as we set off from the shore,” von Moltke wrote, “the kellek was swept away with lightning speed. I could hardly believe that it would take us 10 or 15 minutes to cover an hour’s journey—but how? The Murad [Euphrates], which is over 250 yards wide, narrows to 100, to 80 and fewer yards. The whole mighty mass of water rushes down through this funnel and over boulders, giving rise to enormous whirlpools and waves, so that in some places water fountains five feet high or more rise upright, while on either side the tide shoots quickly against the cliffs and appears as if boiling. The billowing waters literally hit our heads, and the raft was at times completely under water. “The oars were now used with great effort, but it seemed doubtful for some time whether we would reach the shore, or, taken by the stream, be led to a new waterfall. The poles, which were joined to the raft, are 1 ½ to 2 inches thick. Three of them were broken right in the middle, four of the tubes were flattened, and two of them had broken loose and floated away. But fortunately we managed to reach the shore. The length of river described so vividly by von Moltke was precisely the same length of river attempted by the group of Aramcons whose Euphrates adventures will be detailed in future AXP articles. In 1978, Richard Bangs led a successful assault of those same waters, an account of which was published two years later in AramcoWorld. Like the nineteenth century Chesney and von Moltke expeditions, Bangs’ twentieth-century expedition encountered extreme dangers, as would the Aramcon expedition the following year. As an adventure travel guru forever in search of new options he could promote to prospective customers, Bangs envisioned his effort as an exploratory rafting trip that would set the stage for future commercial expeditions. The Bangs Upper Euphrates expedition would serve as the model for a doughty band of ExPats from Aramco when they launched their own assault on those legendary waters one year later. Look for an account of their adventures in future newsletters.